Pope John Paul II was an assiduous teacher. During his long pontificate he gave interviews to journalists which became best selling books and he wrote books about intimate subjects, such as a reflection on his years as a priest. Below is a list of the 5 books published during his pontificate. There are other important books which present very important teachings by John Paul II, such as Theology of the Body - Human Love in the Divine Plan and Love and Responsibility. The latter book was written when he was a bishop in Poland. These very important books are included below. 1. Crossing the Threshold of Hope, by John Paul II; published by Knopf, Inc. (1994). This book is the most popular of John Paul's books. The format is a series of questions from a journalist with John Paul responding. John Paul fills every page with original and fresh answers to very important questions. This is a very spiritual book. In the midst of answering questions John Paul provides important information about what prayer is and why it is so important to the Christian life. He discusses the errors of certain issues such as the Enlightenment and abortion. He talks about the Christian's duty to perfect himself and creation so to offer everything to the glory of God. This is a great book and is highly recommended. The book can be purchased from most online or local bookstores. There is a copy online at the following link: Crossing the Threshold of Hope. 2. Gift and Mystery, On the Fiftieth Anniversary of My Priestly Ordination, by John Paul II, published by Doubleday (1996). An excerpt of this book can be read at Spirit Site. A review of the book can be read at the following link: Gift and Mystery. Gift and Mystery is a work that celebrates the fiftieth anniversary of His Holiness John Paul’s priestly ordination. In a personal spiritual testimony, Pope John Paul II describes his journey to the priesthood, discussing his childhood, education, the years of Nazi occupation that led him to dedicate his life to God, and his ministry within the Catholic Church. 3. The Poetry of John Paul II, Roman Triptych, Meditations, by John Paul II, published by The Conference of Catholic Bishops (2003). This book can be purchased from the Eternal Word Television Network (EWTN). A portion of the book can be read at EWTN's website. The book can also be purchased from most online bookstores. 4. Rise, Let Us Be On Our Way, by John Paul II, published by Warner Books (2004). A chapter excerpt can be read at Excerpts. A great review of the book is available by Bishop Paul S. Loverde at The Catholic Harold. 5. Memory and Identity: Conversations at the Dawn of the Millennium, by John Paul II, published by Rizzoli New York (2005). This is a truly remarkable book. John Paul presents a profound understanding of the rise of evil in Europe, such as Nazism and Communism, and how God placed limits upon this evil. He discusses the ideas of State and Nation and the correct form of patriotism. He discusses the three levels of spirituality, marriage as God intended it, and many other teachings. The title of the book comes from his analysis of the Lord's Supper and how important it is for Christians to constantly remember - Do this in memory of Me - so to not forget their identity as Christians. As psychologists who study human memory will tell you, the loss of memory is truly the loss of one's interior identity. For a review of the book with the table of contents see The Catholic Company. This books discusses important subjects rarely written about. It is highly recommended. 6. 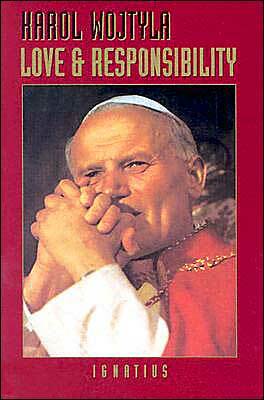 Love and Responsibility by Karol Wojtyla, Pope John Paul II. Published by Farrar - Straus - Giroux (1981). Karol developed the theme of this book while a professor at the Catholic University of Lublin and through the experiences he had in his relationships with young Catholics in their search for love. This is one of the greatest explanations of the Church's teachings on human love. The essence of this book can be summarized by Karol's statement, called the personalistic norm, which states that the human person is never to be treated as an object to be used or treated as a means to an end but must be recognized as a person and treated with love. In this book Karol lays the foundation of this norm for human behavior and beautifully unpacks the full meaning of it. A great example of this is how he uses this norm to explain the Church's opposition to the use of artificial contraception. This is a profound teaching on the correct relationship between man and woman and their relation to God. This book is a must read, especially in our time of great confusion about human love. It can be purchased from most major online bookstores. 7. The Theology of the Body - Human Love in the Divine Plan, by John Paul II, published by Pauline Books & Media. The Appendix includes Pope Paul VI's Encyclical Letter, Humanae Vitae (Of Human Life), Pope John Paul's Encyclical Letter, Evangelium Vitae (The Gospel of Life), and his Apostolic Letter, Mulieris Dignitatem (On the Dignity and Vocation of Women on the Occasion of the Marian Year). The compilation of this book is nothing less than a masterpiece. The essence of this book revolves around a masterful exegesis of Jesus' conversation about the legitimacy of divorce with the Pharisees in Mark 10. The heart of the teaching focuses on Jesus' response, “But from the beginning of creation 'God made them male and female’” (emphasis added). John Paul beautifully reveals how Jesus calls the Pharisees and all people to live marriage as God originally intended it, “from the beginning,” that is, in a loving, total self-giving, indissoluble and monogamous relationship reflecting the inner life and fecundity of the Trinity. This book highlights the regenerative aspect of Jesus' redemption for a union so vital for the good of humanity and the world. This book is very highly recommended and is sold from Pauline Books & Media.